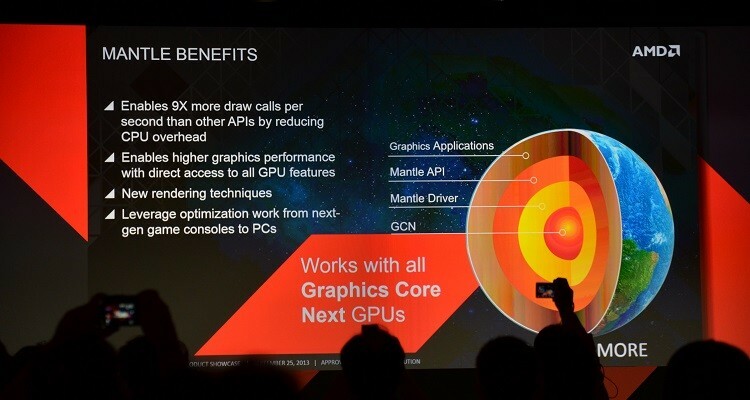 AMD captivated PC gamers around the world last month with the announcement of Mantle, a brand new API designed to fully unlock the graphics potential of their Graphics Core Next (GCN) architecture. Many people assumed that, aside from optimizing the performance of PC games on AMD hardware through low-level 'metal' GPU access, Mantle would allow game developers an easy way to co-develop for PC and next-gen consoles. However this isn't quite the case as it turns out. Microsoft confirmed through a blog post that Mantle is not compatible with the Xbox One, despite the similar graphics architecture found in its custom-built AMD Jaguar APU. Instead, the console solely relies on Direct3D 11.x - not too surprising considering it's a Microsoft-developed API - with specific enhancements designed for "close to metal" performance on the system. While not confirmed, it's also likely Mantle is not compatible with the PlayStation 4. AMD's Ritchie Corpus, director of ISV relations, told TechSpot at the GPU14 Tech Day event that "the current Mantle as we launched it was entirely developed on PC", and although he didn't confirm whether a version or subset of Mantle was implemented on consoles, it appears the API is specific to PC. The lack of Mantle in the Xbox One (and potentially the PS4) won't have a huge affect on PC gaming as it will still be available for game developers who want to implement it; EA DICE is one such studio, who are integrating it into Battlefield 4 and the Frostbite engine. However it might affect the uptake of the API, as it won't be as familiar with console developers as many gamers assumed it would be. Corpus still believes the familiarity between console and PC architecture in the upcoming generation will mean fewer horrible PC ports and easier development of PC titles. How Mantle fits into the puzzle is still unknown, with games using the API yet to be released.